At SSE Airtricity, we’re proud to supply Irish businesses with 100% renewable power*. In 2017, all of the electricity we supplied to our home and business customers (4.7 TWh^) was from renewable energy sourced by SSE Airtricity, significantly abating over 1.5 million tonnes^^ of harmful CO2 emissions on the island. As well as supplying 100% green energy to more Irish homes and businesses than any other supplier, we’re also proud to be the largest generator of wind power in Ireland. SSE’s operational portfolio of 28 onshore wind farms has a combined generation capacity of 768MW, making SSE the largest generator and provider of renewable energy in the all-island Single Electricity Market. This portfolio includes the 169MW Galway Wind Park, now Ireland’s largest wind farm which was jointly developed with Coillte. 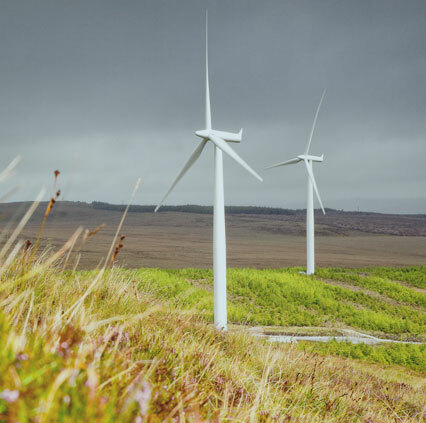 In addition to the renewable energy offtake from SSE plc’s fleet of wind farms, SSE Airtricity also has Power Purchase Agreements in place with third party renewable energy generators for over 300MW of wind and solar-sourced power on the island. Together, we can power the change to a greener Ireland. * Largest provider of 100% green energy claim and total TWh supplied to homes and businesses based on Electricity Market Share by MWh published by the Commission for Regulation of Utilities (CRU) in Retail Market Reports for the periods Q1-Q4 2017. ˄ Total TWh supplied to homes and businesses based on Electricity Market Share by MWh published by the Commission for Regulation of Utilities (CRU) in Retail Market Reports for the periods Q1-Q4 2017. ^^ Quoted CO2 emissions abated based on Average CO2 Emissions (t/MWh) in 2017 in the All-Island Single Electricity Market, and published by the CRU in its Fuel Mix Disclosure and CO2 Emissions for 2017, September 2018.